Syos’ mouthpiece was instantly my firm favorite. Yet, I have been playing my sweet metal mouthpiece for 15 years. Today, it can’t stand the comparison and it gathers dust… And I don’t have guilty conscience even after so many years of loyal service. 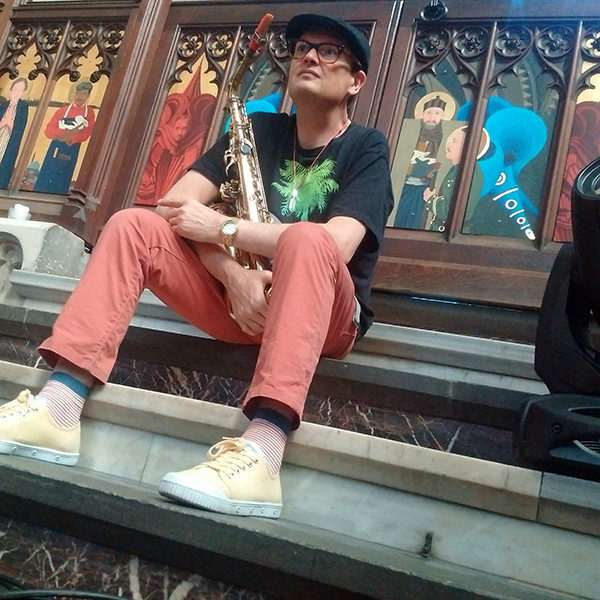 Étienne Jaumet is a saxophonist, keyboardist and French sound engineer born in 1970. He is best known as half of the electro duo Zombie Zombie and a member of the rock band The Married Monk. Étienne Jaumet studied saxophone at the Conservatoire and studied sound engineering. He collaborated in 2008 on the album of his percussionist friend Francisco "Flóp" López, before joining the rock band The Married Monk for their album The Belgian Kick published in 2004. He joined forces in 2006 with Cosmic Neman, drummer of the folk rock combo Herman Düne, whom he met regularly at the Studio d'Oeuvres d'Saint-Ouen, and together they formed the electro duo Zombie Zombie. In parallel to these three groups, Jaumet leads a solo career that takes on the most diverse forms. He regularly publishes EPs on the Versatile label since 2007, including “Vents solaires” in 2013, a duet with the Heldon Richard Pinhas leader produced by I: Cube. He is also the originator of two long albums, first “Night Music” in 2009, produced by Carl Craig and in which Emmanuelle Parrenin takes part, then “La Visite” in 2015. He has also signed several remixes, notably for Tahiti Boy and the Palmtree Family, Yuksek, Ilhan Ersahin, Danton Eeprom, Discodeine and Luke Abbott. Jaumet produced in early 2011 the title 637 of The Big Crunch Theory, a duo made up of Gilb'R and Franco-Swedish Lisa Li-Lund, then ensures the synthesizers on the album House Cube by Emmanuelle Parrenin. The same year, he performed with the Italian trombonist Gianluca Petrella at the RoBOt festival in Bologna and joined the Versatile Noise Troopers group with Gilb'R, I: Cube and Joakim for a gig in October at the Tsugi Federation Festival in La Gaîté Lyrique of Paris. He has since been regularly invited for live appearances, including for Turzi, Frànçois and The Atlas Mountains and even the Red Hot Chili Peppers during their show at the Stade de France in June 2012. He has also participated in the homage tour to John Cage of Cabaret Contemporain, which runs from January 2012 to September 2014, and joined The Inheritors on the live band of James Holden, sharing the scene of the Barbican Theater in London in March 2013 at a Marcus du Sautoy. Eclectic, Jaumet collaborates in November 2013 with the artist Félicie d'Estienne d'Orves for his performance Satori at the Stereolux of Nantes. In April 2015 he recorded a live session filmed at 360 ° for the Sequences collection.